Legislation that would strip campaign finance oversight from the incoming Democratic secretary of state and shift it to a new bipartisan commission is in trouble in Michigan’s Republican-led Legislature. The Senate-passed bill is not on the agenda for a Wednesday committee meeting, an indication that it is at serious risk of stalling in the final week of the contentious lame-duck session. The measure is seen by critics as potentially the most egregious attempt by Republican lawmakers to dilute the authority of a Democrat. Jocelyn Benson was elected last month and in January will become the first Democratic secretary of state in 24 years. Other contentious bills that would empower the Legislature to intervene in lawsuits and make it harder to initiate ballot measures remain under consideration. Legislation nearing the desk of Michigan Gov. Rick Snyder would make it a crime for government agencies to require the disclosure of nonprofits’ donors. Critics decry the move as shielding political “dark money” while supporters defend it as protecting people’s right to freedom of association. The Republican-led House approved the bill Tuesday, meaning it will go to Snyder after a final procedural step in the Senate in the final days of a frantic lame-duck session. The legislation is seen by some as a pre-emptive strike against the incoming Democratic secretary of state and attorney general, who will succeed term-limited Republicans. Politically active nonprofits that spend big on elections and ballot initiatives already do not have to disclose the sources of their funding to the IRS. The legislation would prohibit governments in Michigan from making such information public or even collecting it in the first place — unless there is a warrant or a request as part of litigation. A bill moving forward in Michigan’s Republican-led Legislature is designed to keep secret the identity of donors who give money to nonprofits, including organizations involved in elections. Such groups running issue ads already do not have to disclose their donors. But the legislation approved Tuesday in a House committee would prohibit public agencies from trying to force disclosure or from releasing personal information without permission. The proposed law would not preclude a lawful warrant being used to obtain information. Supporters say the bill would protect people’s rights of association. A former aide to Republican Gov. Rick Snyder is urging him to veto legislation that would make it harder to initiate Michigan ballot measures, should it reach his desk. Bill Rustem, Snyder’s ex-strategy director, issued an open letter to Snyder Tuesday. It was also signed by Doug Ross, a former gubernatorial candidate who worked in Democratic Gov. Jim Blanchard’s administration. Rustem led the 1976 ballot drive for Michigan’s 10-cent bottle deposit law. Ross led a 1974 ballot initiative to repeal a sales tax on food and medicine. The House-passed bill, pending in the Senate, would allow no more than 15 percent of initiative signatures to come from a congressional district. Michigan Gov. 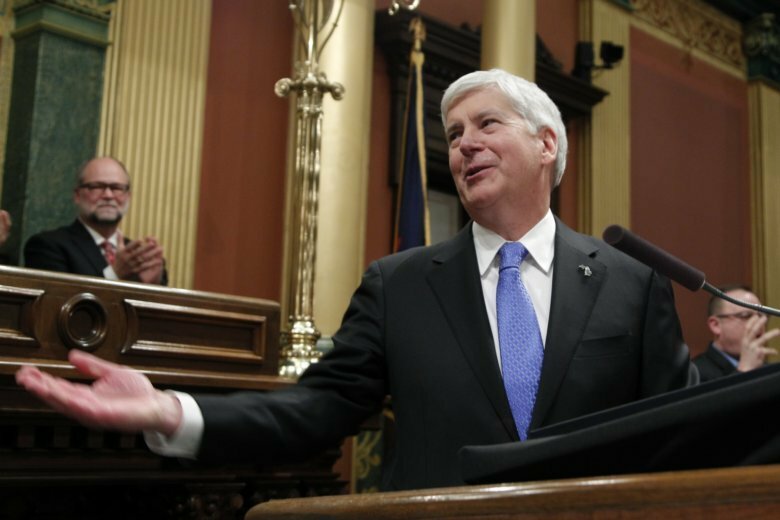 Rick Snyder is the wild card in Republican lawmakers’ attempt to dilute the authority of newly elected Democrats. Wisconsin Gov. Scott Walker signed legislation aimed at taking power from his Democratic successor. But Snyder is not certain to go along with bills that would strip power from the incoming Democratic secretary of state and let GOP lawmakers intervene in lawsuits at a time when a Democrat will lead the attorney general’s office. Snyder is more pragmatic and has not always gotten behind GOP lawmakers’ agenda in his eight-year tenure. Democrats in Michigan are warning Snyder that signing the bills could tar his legacy but he says he does not think about that.